Our guest blog this week is about the travails of the many children of Haitian immigrants in the Dominican Republic who became Stateless one hapless day, as the aftermath of a recent constitutional court ruling. Not citizens of the Dominican Republic, but Haitian neither. Their situation is narrated in this blog post, written by guest writer Quintijn Kat. Imagine being born and bred in a country. It flows through your blood, it flows through your consciousness and it flows through your conscience. You have laid claims on its language and culture most naturally, simply by growing up with it. You have played on its streets, and followed its school systems. For most people, the country in which they grew up is part of their persona in in-extractible ways. Whether you are conscious of it or not, whether you like it or not, the country you have grown up in, forms your identity. And not just emotional and intellectual, but your official as well. You draw your citizen duties and rights from it. Now imagine this country stating one fine day and without warning, to unsuspecting thousands that they are in fact not part of it but that they are alien, foreigners, and illegal at that. And, with this declaration, stripping them off at once, of both their existential continuum and citizen rights and identity. This is in short what happened to tens of thousands of Dominicans on 23 September 2013. On this day the Constitutional Court of the Dominican Republic ruled that children born in the Dominican Republic of foreign parents, going back to 1929, are not Dominican nationals but in fact illegal aliens. Dominican Republic’s 2010 Constitution states that citizenship can be granted to only those with at least one parent who is a legal resident, but it also states that new laws cannot be applied retroactively. The current ruling however reverts this stating that the citizenship policy will in fact be used retroactively. In effect, many of those who assumed a few years back that they were legal citizens of the country are suddenly haplessly stateless. The ruling, known as ruling 168/13, mostly affects Dominicans of Haitian descent since people of the neighbouring Haiti are the biggest immigrant group in the Dominican Republic. Both countries share the island known as Hispaniola and have a long history of immigration-related problems. Since the 1920s many Haitians have migrated to the more prosperous Dominican Republic in search of work. This migration flow was stimulated actively by the Dominican Republic which found itself in need of hands to work in its booming sugar industry. When the Haitian labourers were not needed as much as before, mainly due to industrialization of the sugar production business, many Haitians stayed in the Dominican Republic, the men working mostly in construction and women mainly as helps in Dominican households. What is important to know is that in the Dominican Republic race, and especially skin colour, to a large extent defines social class. Where the lower class is made up of mostly dark skin people, whites and mulatos make up the middle and higher classes. Haitians, descendants of African slaves brought to Hispaniola by European slave traders, are predominantly dark skinned. This has caused a stigma in Dominican society against Haitians who are being associated with poverty, unemployment, crime, and the spread of disease, especially since the outbreak of cholera in Haiti following the devastating 2010 earthquake. The disaster also triggered another wave of immigration of Haitians trying to flee the consequences of the earthquake. It is in this setting that Juliana Deguis Pierre, a young woman born in the Dominican Republic, of Haitian parents went to a civil registration office to ask for an identity card. She carried her birth certificate with her in order to proof she had indeed been born in the Dominican Republic. However, instead of receiving her identity card, the official confiscated her birth certificate declaring it invalid. The reason allegedly was that Deguis Pierre is a Haitian name. Having lost the only document that proved her existence, Deguis Pierre did the only thing she could do. She went to court and fought the authorities’ decision. Many appeals later the case came before the Constitutional Court which ruled against Deguis Pierre, setting the precedent for tens of thousands of other people in similar situations in the Dominican Republic to suddenly become stateless. The consequences of this ruling are huge. As per official estimates, 500,000 Haitian immigrants, both legal and illegal, live in the Dominican Republic. A UNDP representative told me that the actual number would be probably twice as high, approaching one million Haitians. Whether or not these numbers include the Dominicans of Haitian descent who are affected by the Constitutional Courts ruling remains unclear. Making accurate estimations is troublesome, exactly because many Dominicans of Haitian descent are not registered and obviously neither are illegal Haitian immigrants. The Dominican government claims around 24,000 people will be affected by the Constitutional ruling. Human rights defenders set this number at a staggering 200,000 affected. Needless to say, the issue has alarmed the international community. US vice president Joe Biden, expected to visit the Dominican Republic this year, has made it clear that ruling 168/13 was high on the list of issues he would discuss with President Medina. International organizations such as the Central American Integration System (SICA by its Spanish initials), the Caribbean Community (CARICOM), and the Organization of American States (OAS) have voiced their severe concern. The Head of the United Nations Stabilization Mission in Haiti (MINUSTAH), Sandra Honoré and Amnesty International have urged the Dominican Republic to come up with a solution which respects human rights and prevents an escalation of the affair. The Inter-American Commission on Human Rights (IACHR), a body of the OAS, even summoned the Dominican Republic to explain the situation at its seat in Washington DC. A group of people affected by the ruling, including Juliana Deguis Pierre, were supposed to be present at this hearing. Deguis Pierre received a US visa on “humanitarian grounds” by the US State Department but was denied access to her flight by the Dominican authorities. After all, she did not have a passport and thus was not allowed to travelGranting her visa by the US caused a huge scandal in the Dominican Republic because on the visa the US State Department had put “Dominican” as Deguis Pierre’s nationality. This led the Dominican minister of Foreign Affairs to indignantly remark that the US had no right to “grant” anyone the Dominican nationality since this is a unique and sovereign right reserved to the Dominican Republic. In fact, this resembles the Dominican stand in the whole issue. The authorities see the affair as a domestic problem and act accordingly. They underscore that any interference by the international community is a breach of Dominican sovereignty and they count on the support of the majority of the Dominican people who see Haitians as a burden on their society. Therefore, the IAHCR’s urge to the Dominican Republic to handle the situation with great care and guarantee respect for human rights for all affected, has gone unheeded. So, what is going to happen now? While many Dominicans of Haitian descent protest the ruling on a daily basis in front of the National Palace in Santo Domingo, president Medina is drafting a Naturalization Bill for approval of Congress that is supposed to deal with the issue. The content of this bill is greatly anticipated for it will have enormous consequences for those affected, and for both the Dominican Republic and Haiti and their already troublesome relations. In the meantime, the only available legislation is the National Plan for the Regularization of Foreigners. This plan requires foreigners to register so they can apply for citizen rights in the Dominican Republic. 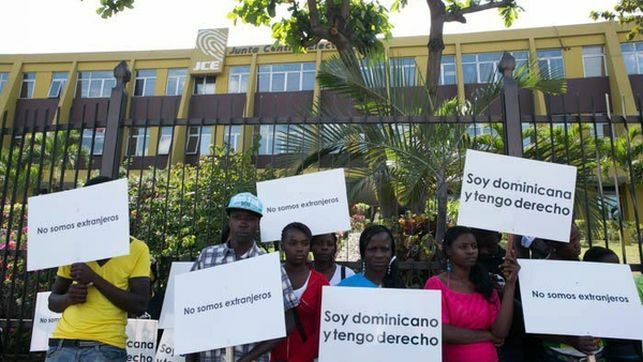 The IACHR already asserted in its findings that this National Plan should not apply to those affected by Ruling 168/13 because it would require people who, in the IACHR’s view, are Dominican to give up their rights as citizens and register as foreigners in order to possibly regain those same rights. The Dominican Republic’s authorities however do not agree and have yet made clear that whoever does not register under the National Plan, nor can be naturalized under the yet to be presented Naturalization Bill, will be treated as an illegal alien and consecutively deported. This would in all probability mean that those people would be send “back” to Haiti, a country where they never lived, and whose language they do not speak. Besides, there is no reason for Haiti to accept these people as Haitians, exactly because they were not born in Haiti and would be seen as foreigners in Haiti as well. In other words, the thousands of people affected by Ruling 168/13 could become effectively stateless when president Medina presents his Naturalization Bill. In the meantime some consequences of the issue can already be seen. Last week, a study found that children of Haitian descent are being denied access to schools in parts of the Dominican Republic because of Ruling 168/13. The Dominican Ministry of Education therefore has denied the claims of the study and continues to countervail this ground reality with the stated constitutional position which declares that all children in the Dominican Republic, irrespective of their legal status, have a right to education. It is exactly this kind of consequences that make Ruling 168/13 such a precarious issue. In a country where people of Haitian descent are already being stigmatized, this Constitutional Ruling now backs up their being treated as secondary citizens. This endangers their rights and plays in to racist sentiments that exist in Dominican society towards Haitians in general. President Medina’s Naturalization Bill will have huge consequences for those affected. It could guarantee them the rights to which they should be entitled, as confirmed by the IACHR, or it could declare them foreigners without a homeland. This post has been written by Quintijn Kat. Quintijn, currently lives in the Dominican Republic and works with the Dutch Ministry of Foreign Affairs. He is interested in International Affairs. The views expressed are the author’s own and do not represent that of any organization. One hardly gets to hear about the Caribbeans! At the most it is about the calamities of Haiti. Ironically this huge calamity, didn’t even reach me, and I am a regular follower of news.